Input: VHF 7-Chs. 36 dBmV Max. 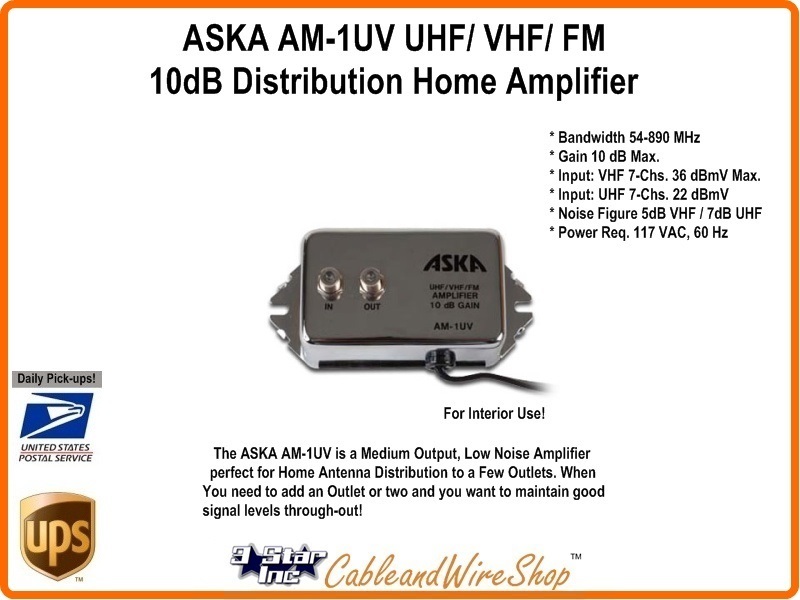 The ASKA AM-1UV is a Medium Output, Low Noise Amplifier perfect for Home Antenna Distribution to a Few Outlets. Note: If you need to Add a couple of HD Ready TV sets to your TV Antenna Hook-up, this amp will do fine to Offset the Loss encountered when adding a Splitter To feed the additional Outlets. In addition, it comes with an adjustable Gain control, so you can find that sweet spot and save (in reserve) some gain for future additions and signal Splitter, or balance the amplifier out to feed another amp at the other end of a cable segment to extend your systems reach to another building. It is Forward only (54-890 MHz), which matches the Bandwidth of any TV Antenna System, but will not pass return from High Speed Internet Modems or Pay Per View Converter Boxes associat3ed with Cable TV signals. We have Amplifiers that will do that. See Below! Check Your Picture quality where the Cable TV feed enters your Home, if it's good there, you can replace connectors, cable and Splitter to bring your installation up to the newest specifications. If you are feeding numerous TV sets or long Distances, use this Amplifier before the Splitter Or long cable run to maintain Signal Quality. Pre-Amplifiers are mistakenly used with the rational that it will bring in Stations that weren´t there before... It won´t, and what´s worse, using the same antenna and pre-amp with FM and TV stations close by (0-30 miles) may overdrive the amp and actually impede your ability to provide goods signals to your TVs. If you desire to use a pre-amplifier, don´t use a high gain when you have local stations, get one with a FM trap to keep FM radio stations from over-driving the amp and remember that today´s Digital Signals don´t need to be high to get a picture. Some Pre-amps come Band Selective as well, realizing that the difference in antenna UHF/VHF gain means that one band needs to be amplified as opposed to the other. Use them to maintain Signal level to noise at the origin (your antenna) so that low signal levels from far away stations are not lost in a longer than average cable run to the location in the house where the signals would be further distributed to the TVs desired. Amplifiers come with various gain numbers. Old Analog signals needed a high Carrier to Noise to get a high Signal to Noise Ratio of the Picture on your TV set, it was a one to one relationship and more was sometimes better. Digital Signals are lower in amplitude in comparison to Analog (a benefit) and that commensurately, the threshold at the TV is lower for a perfectly good picture. Very little in between, you either get a good picture or you don´t. Snow in the old analog pictures has been replaced by "Tiling" or little blocks within the picture not keeping up with the scene changes in today´s Digital TV viewing. Tiling is therefore today´s Digital Snow. It means (more often than not) that you are not far enough above the threshold of signal level into your TV to prevent little hiccups, drop-outs and interferences in signal from interrupting the Stream of Data. Remember that lots of things can happen from the Station on the way to your TV set!